A FINE GAEL TD has called for an extra security presence on the Luas Red Line to deal with what she said were “high-levels of anti-social behaviour”. Catherine Byrne, a TD for Dublin South Central, said that she had written to the Railway Procurement Agency (RPA) to voice her concerns about what she said was “inadequate security” on the Red Line. Three-quarters of all public disorder cases on the Luas tram service occur on the Red Line which runs from Saggart in south west Dublin to The Point in the city’s docklands. 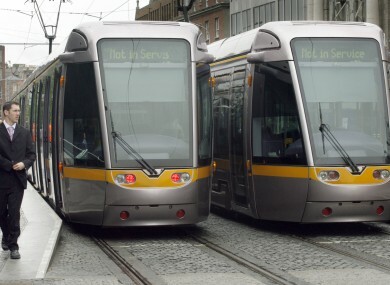 There was an 11 per cent increase in the number of public disorder cases with 970 instances last year compared to 870 in 2010 on both Luas lines, the trams’ operators Veolia Transport disclosed in January although there was also a 6 per cent increase in the number of passengers. “Security on the route is clearly inadequate,” Byrne claimed yesterday. “I wrote to the RPA to raise my concerns about this issue, and I have received a response from Veoila, the operator of the Luas. Veolia says that the security firm STT Security patrol the Red Line from 10am until the last tram seven days a week and has also said previously that it is working with school children and community groups in order to forge a relationship with them. “Luas customers are suffering here; people are feeling threatened and in some cases are avoiding taking the tram as a result. As the private operators of a public service, the company has a responsibility to provide adequate security, day and night,” she said. Byrne added that she would continue to push Veolia Transport in relation to this issue. Email “TD calls for more security on the Luas Red Line ”. Feedback on “TD calls for more security on the Luas Red Line ”.